The National Renewable Energy Laboratory (NREL) and Denver-based software developer concept3D have developed the simuwatt Energy Auditor, a tool that could replace clipboard-style audits with a computer model that could save money for building owners. The tool that pinpoints potential energy savings could cost 35 percent to 75 percent less than traditional audits. The package is set to hit the energy retrofit industry next year after tests are completed at six Department of Defense facilities over the next few months. Audits conducted by energy service companies (ESCOs) could be cost-prohibitive for a small building owner. But the simuwatt Energy Auditor allow ESCOs to perform audits using mobile tablets and advanced energy modeling, skipping the steps of manual input and transfer. The intent is that lower costs would create more savings and extend the benefits to even more building owners. Also, the finished audit is stored electronically and serves as the baseline for the next audit, which is typically done a few years later. 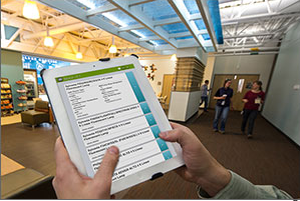 NREL said the simuwatt Energy Auditor is a combination of different ideas that marry the energy audit with energy modeling through OpenStudio and other tools. NREL said no other commercially available product has the ability to collect building data onsite, automatically move the data into an analysis tool, and perform a detailed energy simulation this quickly. The commercial buildings sector in the US alone represents 7 percent of total energy consumption worldwide. Commercial buildings consume about $134 billion in electricity each year, according to DOE. A 200,000-square-foot office building that pays $2 per square foot in energy costs annually can save tens of thousands of dollars with a modest reduction in energy consumption. This entry was posted in Industry News and tagged Audit, Concept3D, Denver, Energy, Energy audit, National Renewable Energy Laboratory, nrel, Setpoint Systems Corporation, United States Department of Defense on November 13, 2013 by setpointsystems.